I'm trying to decide between two of my wine storage options for long-term storage of some decent wines. I have what I thought was a nice wine refrigerator (GE Monogram). 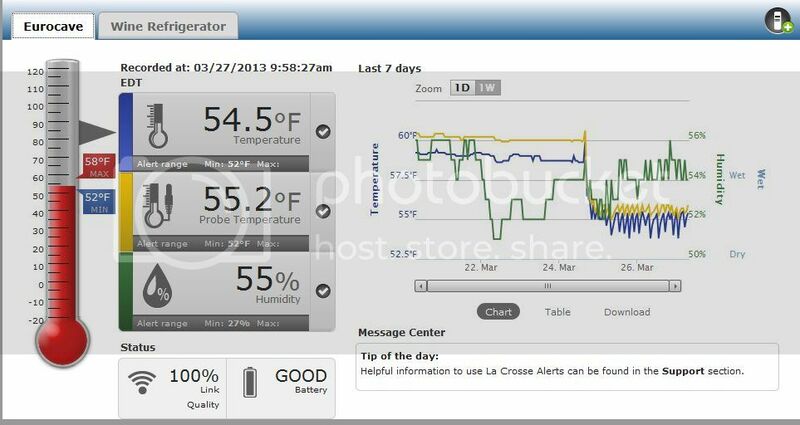 However, I recently installed a LaCross wireless temperature and humidity gauge and found out it may be otherwise. While the average humidity for the refrigerator is around 75%, it varies between 65% and 80%, based on whether the compressor is running. The temperature also varies between 52 and 56 degrees Farenheit, based on when the compressor runs. The compressor runs on roughly a 3 hour cycle. My other option is an unfinished closet space in my basement. While the temperature and humidity of this area doesn't vary as quickly as the refrigerator, over the course of a few days, it does have some minor variation (1 degree and 10% humidity). My biggest concern of this space is that the temperature is higher, around 65 degrees Farenheit. If you had the choice for storing wine for a decade or so, which would you choose? Don't sweat the humidity, but 65 degrees seems a bit high over the long term. Hoards of people on these boards with more experience than me, though. I'm looking at a Eurocave or proper wine cellar as a long-term solution. However, I don't think my wife will let me get one in the near term. I appreciate the response. while i am no expert by any means hpwever when I used to use digital wine cellars they did not have compressors on them as the vibration is not good for the wines. Your fluctuations in temp and humidity are not troublesome imho. I would keep them in current ge device versus moving to uncontrolled environment such as closet. You sure your basement only gets up to 65? I'd take some readings thru the summer before I'd trust that temp to be solid. If so, and if you can get it a little cooler even, that would save you some money. I've had a Vinoteque for like 20 years and it's still working perfectly and the wines are really fine. Only holds 250 bottles tho, so we ended up building a cellar in the basement. I did it myself so it cost a lot less than if I'd hired someone and it holds 10 times as much as the cabinet for about 1/2 the price. Personally, I think if you have the space, that's the best option but the Eurocave wouldn't be bad. Guaranteed tho that in 20 years you'll want another Eurocave or two! I'm not that concerned with the humidity fluctuations. I started out not being concerned with the temperature fluctuations either as the temperature of the wine itself wouldn't vary much. However, I started thinking that the air in the bottle might change, which would lead to fluctuations in the pressure in the bottle, which could lead to seepage through the cork. It could definitely also be an over reaction and a simple case of worrying about something just because I can now measure it! As far as the basement temp, I haven't had a thermometer in there in the summer yet, so there could be a rise in temperature. I'll definitely monitor it. I do have the thermostat in the basement set to a maximum of 76 degrees. The closet is an unfinished space between the climate-controlled basement and a poured-in-place concrete retaining wall and is about 10 feet below ground level. CJO - I monitored my basement for a couple years before deciding what to build. It was OK - the house was being renovated really slowly and I put stuff in storage. But I was really surprised. In July/August/Sept, the temps got into the high 70s some days! I never expected that. So while right now it's just under 60 and fine, I can't count on that all year. Still however, if you only need the cooling a few months out of the year, you can save a lot of money. As far as the air in the headspace - I wouldn't worry all that much unless you hit extremes. More important is the fact that over like 65 or so, Brett and other things can grow pretty fast. Thanks! I really appreciate the advice. For the near term, I'll see how warm the closet gets in the summer and continue to keep my best bottles in the wine fridge. Hopefully a true wine cellar is in the budget sometime in the next couple of years! Wine crates are a great way to store and protect bottles. They also add a unique and decorative twist to the cellar. Feel free to visit Winepine, and take a look at some pictures! Only have good experience with basements (as long they are frost-free, and no furnace is nearby!). Keeping the bottles in crates (or cartons or trunks) helps, and so would a massive rack made of bricks - all of this will buffer sudden changes in temperature. I am stacking them in the closet (including some in their OWC). I am considering making some containers that are half of a cube, with 3 sides of plywood with board insulation and the other 3 sides open to the concrete floor and walls. Yes, just make sure the materials are not releasing funny smells. Looks like I just stumbled upon another option. I found a Eurocave for $350 locally. I'll be picking it up Saturday! I think that the EuroCave was a good investment. Here's a humidity and temp log. The left side was from the closet. The right side is in the newly installed EuroCave. How many bottles does it take? you found a eurocave that holds 260 bottles for $350? are you missing a zero? how used is this cabinet? do they have any more at this price? I was pretty lucky. Found it on Craigslist locally from someone upgrading to a full cellar. Sorry, they didn't have any more.